At the time the bank was built, it went by the name of Sedan National Bank, later changed to Sedan Saving Bank. 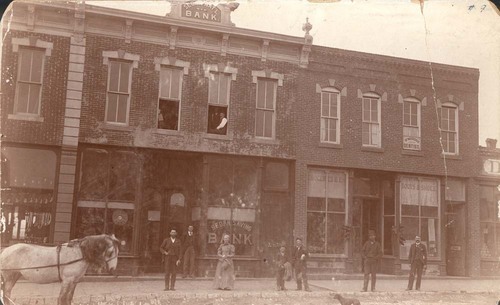 A printing office was located on the second floor above the bank. In the building on the right, D'Maddux, a dentist, had his office on the second floor. A grocery store and Boots and Shoes shop occupied the first floor of the building on the right.